A bastion of neo-liberalism? Cambridge's King's College. Wikimedia/Dcrjsr. Some rights reserved. 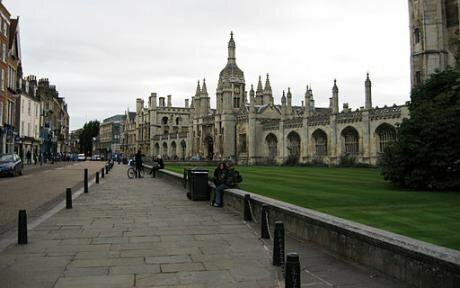 A new campaign at Cambridge University, ‘Whose University?’, has provoked King’s College into letting the mask of its humanity slip, revealing the ugly face of its neoliberal ideology. The campaign itself was founded by students in response to the fact that most students who live in college are required to empty their rooms of themselves and all of their possessions over the holidays. This is to make way for the lucrative conference season. ‘Whose University?’ highlights the fact that not all students are privileged enough to have a parent or guardian able to collect them at a stated time and date, with all of their belongings, to drive them home at the end of the term, nor even to have a safe home to which to return. Perhaps more concerning, especially given the record of the University in this regard, the brief nature of the University term, and the inability of many students to stay in the town over holidays, is having the effect of depriving students of access to much-needed mental health care, as it often takes longer than the duration of a term to obtain an appointment for counselling services. Of course, some students are able to pay for more expensive contracts on their rooms, that enable them to remain in Cambridge over the holidays, but it should be evident that this option isn’t available to those that need it most. ‘Whose University?’ has been seeking to rectify some of these glaring access issues in the University through direct action, by setting up a forum on social media through which people can volunteer excess storage and sleeping space over the holidays and advertise the need for the same. It was in response to people beginning to make use of this network, and particularly to an email sent to all students of King’s College informing them of the space-sharing project a few days before the end of term, that the Lay Dean of the college, Dr. Paul Ryan, sent a threatening email to all undergraduate members of the college. In it, he reminded his audience that residents of the college are “not allowed to store anyone else’s belongings in [their] room,” for reasons of security and so as not to impede housekeeping. The manifest impossibility of discerning whether or not someone has stored another person’s belongings in their room is being circumvented by Ryan by simply removing “any items that clearly do not belong to the student to whom the room is assigned”, with further disciplinary action threatened. Why such a paroxysm of authoritarianism on the part of the college? This room-share doesn’t threaten the college’s ability to host guests over the Christmas holidays, as all rooms on non-holiday lets will still be vacated, ensuring the college the steady stream of revenue it so covets. What it does, however, is threaten the college’s ability to convince students to take out long contracts in the future. If students are able to organise to reduce their individual reliance on more expensive holiday lets, by sharing spaces and splitting the costs, then the college presumably won’t be able to secure quite so much money from its student residents in years to come. This, the college would presumably contend, would threaten its ability to provide for the welfare of its members. Indeed, this is frequently the justification trotted out by the apologists for recent reforms to universities that have seen courses axed, fees almost universally held at £9000 across the board, in spite of David Willets’ protestations to the contrary back in 2010, and soaring rents being charged of students. Without this flow of revenue into the bursars’ coffers, university managements across the country contend, vital services will need to be cut and the ‘student experience’ will suffer. Yet when a group of students organise themselves to mitigate the damage being done by the fact that their college isn’t providing for their needs, is failing to provide a satisfactory ‘student experience’ in the most obvious and damaging way, and is leaving them vulnerable, open to abuse, and sometimes homeless, disciplinary action is threatened. This gets to the heart of the neoliberal ideology which underpins the British Higher Education System post-2010, and the ambiguous position of the student therein. Universities are now businesses in every aspect except for their lack of an owner to whom to pay their profits (although the ballooning pay of management is a contender by proxy). The Conservatives’ reforms of 2010 were packaged in rhetoric of universities being self-supporting, of money ‘following the students’. Universities now have to find new revenue streams to support themselves, as does everything in Cameron and Osborne’s business-savvy Britain. It is the same logic that is leading UCL to attempt to install ‘retailers’ in its ‘Bloomsbury Masterplan’, which includes a ‘teaching and learning “high street”’ at the expense of departmental and library space. This would, as with rail privatisation, of course lead to a better and more affordable service for all. But, as with rail privatisation, it seems that ‘all’ means financiers, share-holders and management, with everyone else reduced to the status of either ‘potential source of revenue’ or ‘nuisance’. It is an approach that has unambiguously killed the old notion of the university, as a free association of academics and students. Now, instead, students are simultaneously workers and commodities. They work to produce the image of the university as academically rigorous, by getting good grades, and as enriching, by having the approved forms of fun and developing as young adults along proscribed lines amenable to the University’s marketing materials. And they, as graduates, are the true product of the university, shown off as a thing to which to aspire, whose image is ‘bought’ by career conscious applicants. Meanwhile, at King’s, the college has recently invested in a number of new signposts reported to cost £720 each to ensure that their corporate conference guests can find their way around in tasteful style. What the Lay Dean has done in his email is let slip the fact that although the business interests of Universities and Colleges across the country are framed in terms of benefitting the lives and experiences of students, in truth they do no such thing. Such claims are a liberal shawl draped around the shoulders of a ruthless process of acquisition for its own sake. And when self-directed attempts to meet the needs of students threaten the College’s income, it is those to whom the College owes a duty of care who are swept out of sight. All of which offers a simple answer to the question that ‘Whose University?’ poses: no longer ours. Dr Paul Ryan’s response to this article can be read here.